Happy First Fiesta Friday anniversary! We had neighbours over last night, and thought this might be a good choice to start a light vegetarian dinner. Having Italians over can be daunting, especially when they are excellent cooks and can argue at length about spaghetti widths, aubergine varieties and other such critical culinary points. Making this tart again might work, we thought, and it is also my contribution to the First Fiesta Friday anniversary. Fiesta Friday is like a really interesting weekly neighbourhood dinner, with some familar faces and some new. Each week I am inspired, impressed and grateful for all the wonderful ideas, recipes and writing, so thanks so much! Special thanks to our lovely FF52 co-hosts: Angie@The Novice Gardener, Hilda @Along The Grapevine and Julianna @Foodie On Board. Mix pesto and ricotta, half of each, with a little salt and pepper. 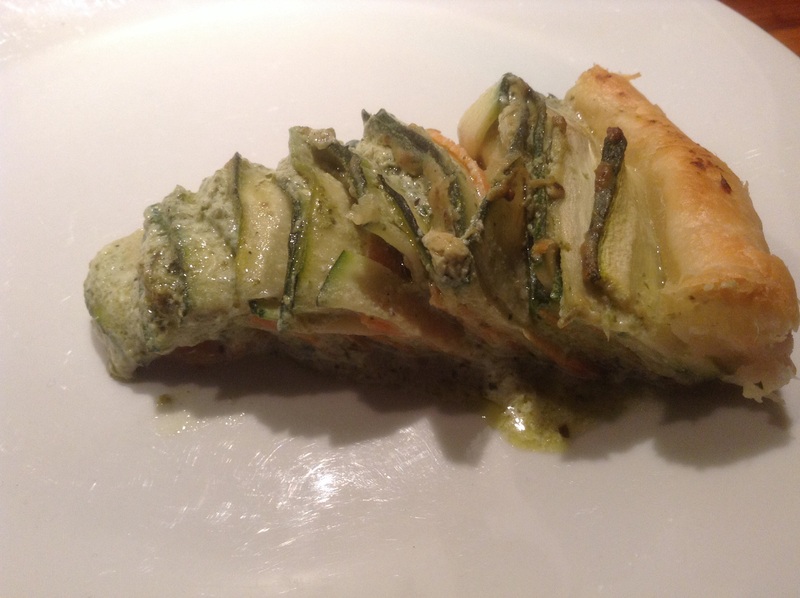 Spread some ricotta-pesto mix on the strips of carrot and zucchini. Roll the strips somewhat tightly together, so they looks like a rosebud. (Yes, albeit a pesto-smeared, green one.) This is finicky, but the rolls held together well. 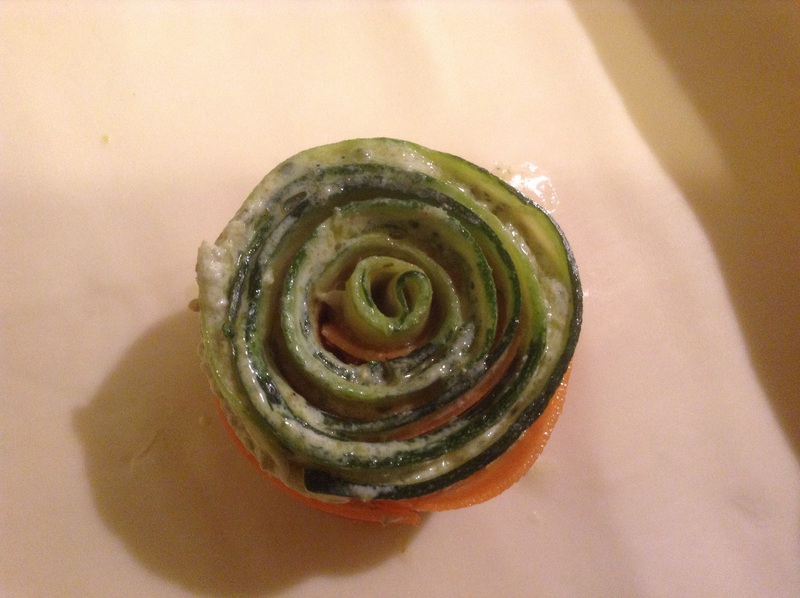 Alternate carrot and zucchini, rolling until you have a good sized roll. Lift it carefully over onto pastry, and add last strips to fill the dish. Tuck the pastry edges over. If you have extra pesto-ricotta, feel free to spoon it into the crevices. Bake at 200C until it looks done. Time and temperature depends on your pastry and oven, last time 20 min at 180 was enough but this time it took 35-40 min and I increased he temperature. Slice into wedges and enjoy. Enjoy! We did! And our dinner with the neighbours went well, I think. They are really nice, forgiving of our gaps on speaking Italian, and we laughed a lot. 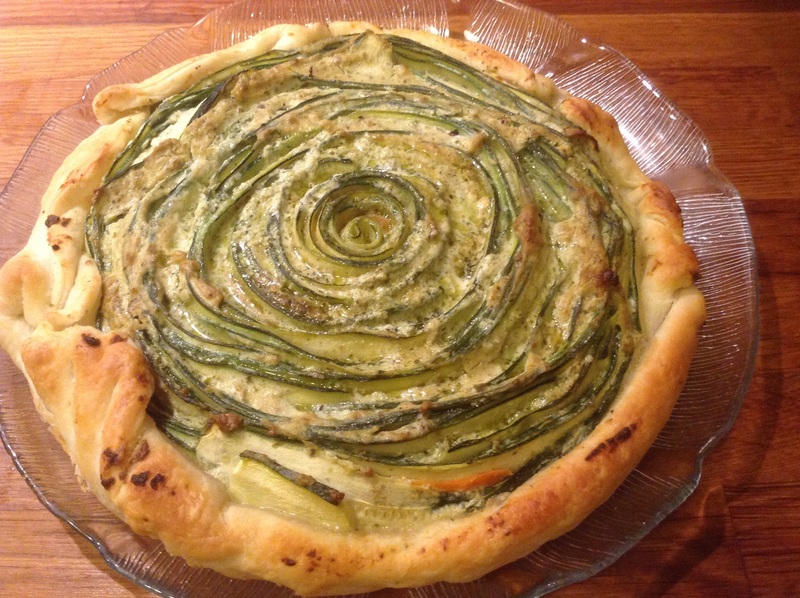 This entry was posted in food and tagged Fiesta Friday, pesto, ricotta, tart, zucchini on January 24, 2015 by krumkaker.